In the last edition of Franklin AID, we demonstrated how to enter information into Franklin Electric’s Solar Selector. We selected Amarillo, Texas as the location and in this fictional example, the end user initially specified 900 gallons per day. However, let’s say that he has since come back and said that he actually needs 9000 gallons per day. No problem, right? We can easily input the new requirement into the Solar Selector. Although this information is interesting, what we really want to know is which SolarPak system is needed. The Solar Selector figures this out automatically. In this case, the Selector has specified model 25SDSP-3.0HP. Although you actually don’t need to make the translation, this means a 25 GPM unit attached to a 3 horsepower motor. Below this you can see the monthly performance of the system. For example, in October this installation is projected to be able to deliver 9102 gallons per day, based on the system capability and the average solar hours. In summary, all we’ve done is provide the location and water requirements. The Solar Selector has done the rest, telling us which SolarPak product is right for this installation. There’s one more piece of information that the Solar Selector needs: the electrical characteristics of your panel. These values are specified by the panel manufacturer and in this example, the panel manufacturer tells us the each panel delivers 250 watts at its maximum power point (Wmpp), its open-circuit voltage (Voc) is 37, and the voltage at the its maximum power point (Vmpp) is 30. Note that these are for each individual panel. (For an explanation of these terms, see the post Solar Power for Subs: The Panels.) 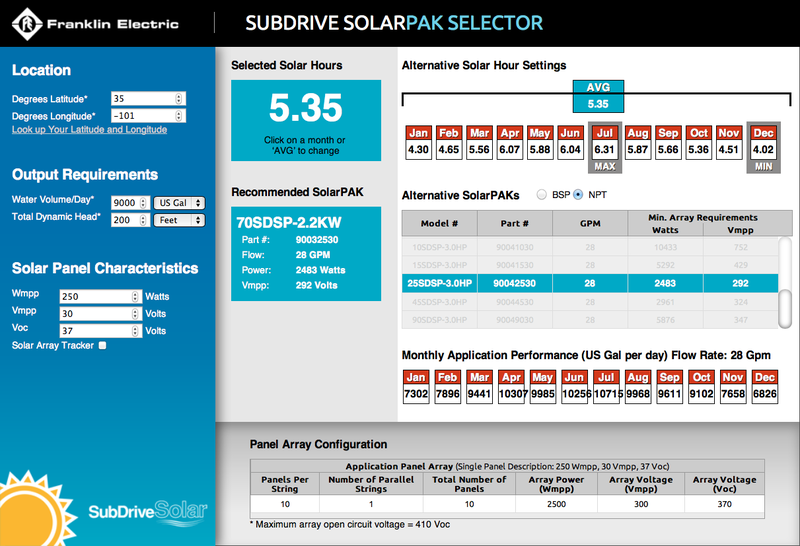 Given this information, the Solar Selector tells us how many panels we need and in what configuration. In this example, we need a total of 10 panels connected in a single parallel string. There you have it. From three pieces of information – location, water requirements, and panel characteristics – Franklin’s Solar Selector has done all the work to spec our SolarPak and our array. In the next post, we’ll discuss connecting panels in parallel versus connecting them in series.